NOW, MORE THAN EVER, the voice and ideas of entrepreneurs and small business owners are needed to help shape policy and drive solutions! 2018: The Year of BIG Small Business Growth and Sustained Optimism – JOIN US TODAY! SBE Council advocates for policies that improve the environment for risk-taking, investment, and small business growth. We are working on multiple policy fronts that will help fuel strong and sustainable economic growth. U.S. entrepreneurship is making a comeback, and the economy is gaining strength. The much improved policy environment, due to SBE Council’s advocacy work, has led to stronger economic growth and strengthened the confidence and bottom lines of America’s small businesses. On the heels of tax relief made possible by the “Tax Cuts and Jobs Act,” SBE Council is focused on “unfinished business” like further improvements to the tax code (i.e., simplification) and making the tax cuts deeper and permanent. We are getting closer to fully modernizing the regulatory system, and continue to have success in advancing policies and regulatory changes that improve capital access, and create a more affordable marketplace for health coverage and health care choices. SBE Council also continues to work on a range of policy initiatives to improve global market access, expand quality broadband access, and fixing many government-imposed inequities that have put America’s small businesses at a competitive disadvantage. Each and every day, SBE Council works hard to help lawmakers on Capitol Hill and in the states, policy leaders and President Trump’s team understand the need for a first-class ecosystem to enable small business growth. This also includes common sense policies for improving our nation’s educational system, infrastructure, and addressing the “skills gap” so that small businesses have the quality workforce they need to operate, scale and compete. TAX REFORM: SBE Council’s efforts on the “Tax Cuts and Jobs Act” were key to its passage, and now we are working to make provisions that will expire more meaningful and PERMANENT for small businesses. In addition, we continue to advocate for common sense changes to tax compliance that reduce costs and burdens for small businesses. We are working directly with Congressional leaders and the White House on “Tax Cuts 2.0” and advocating for reforms embodied in the bipartisan “Small Business Tax Simplification Act,” H.R. 3717. 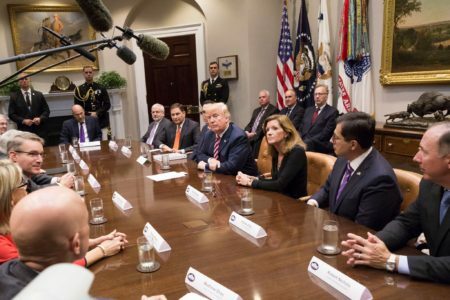 On the 6th month anniversary of the “Tax Cuts and Jobs Act” (June 29, 2018), SBE Council president & CEO Karen Kerrigan was recognized by President Trump at the White House for the organization’s work in helping to move the package through Congress and to the President’s desk. CLICK on the photo above to watch/hear the President recognize Kerrigan. Read SBE Council’s 2018 Agenda for Tax System Modernization here. HEALTH CARE REFORM: The Patient Protection and Affordable Care Act (ACA – aka Obamacare) only increased the cost of health insurance for small businesses and the self-employed. The ACA imposed new taxes and costly mandates on small business owners and entrepreneurial firms. New compliance requirements – expanded reporting, and the employer mandate – are burdening small businesses with new costs. The ACA’s mandated design of insurance plans has driven costs higher and eliminated choices in the marketplace. SBE Council has already been successful in making regulatory changes to the ACA, delaying a variety of tax increases in the law, and urging policy makers to allow the health care market to innovate and test new models for delivering health care. Taxing health insurance companies, health insurance plans and our most innovative companies in the health care sector (like small medical device manufacturers) is raising health insurance costs and hurting innovation. SBE Council supports the full expansion of Health Savings Accounts (HSAs), a national marketplace for health insurance, medical liability reform, group purchasing pools, and other reforms that bring market discipline, entrepreneurial innovation and choice into the health care system. To get an update on our progress so far in 2018, please read my recent blog, Curing Health Coverage Costs: A Progress Report. Read SBE Council’s 2018 Agenda for Health Care Affordability and Innovation here. REGULATORY MODERNIZATION AND REFORM. Regulatory excess is squeezing the profitability and survivability of many small firms. SBE Council has supported the broad regulatory relief efforts of the Administration, as being executed through President Trump’s various Executive Orders. Our staff and members have weighed in with various agencies and departments such as the Department of Labor, Federal Communications Commission, Health and Human Services, Consumer Financial Protection Bureau (CFPB), the Postal Commission and other federal entities regarding reforms under consideration. After successfully advancing a package of regulatory reform bills through the U.S. House, the U.S. Senate is now moving these important bills, which will require that proposed regulations undergo a thorough cost-benefit analysis, timely review of these regulations in the future, and that the process give small business owners a meaningful and early voice in the regulatory process. SBE Council strongly supports, for example, the “Small Business Regulatory Flexibility Improvements Act,” (H.R. 33 and S. 584), which would make these improvements. Workplace Regulation: SBE Council strongly supports efforts by the National Labor Relations Board (NLRB) to fix the expanded and complex “joint employer” standard. The current standard is damaging small business growth and innovation in the franchise sector. SBE Council also supports a legislative solution to joint employer, as embodied in the “Save Local Business Act,” H.R. 3441. One-size-fits-all and complex rules that attempt to micromanage how and what employers pay their employees, how they operate their safety programs and communicate with their workforce, are outdated approaches with serious consequences for our economy and quality job growth. SBE Council is working to modernize laws and regulations that allow for more flexibility in the workplace so that business owners can more effectively provide employees with work arrangements that best meet their family and personal needs. Read SBE Council’s 2018 Agenda for Regulatory System Transformation and Reform here. ACCESS TO GLOBAL MARKETS: Entrepreneurs want access to international markets to sell their goods and services. The U.S. must continue to engage other nations in trade agreements to enable a more prosperous, interdependent and peaceful world. SBE Council is urging Congress and the Administration to pursue new trade agreements and modernize the NAFTA accord. Lowering trade barriers will allow more small businesses to go global and grow. Along with trade, SBE Council is the leading small business voice urging the Administration to secure and enforce intellectual property (IP) protections at home and abroad, including within a re-negotiated and modernized NAFTA. Read SBE Council’s 2018 Agenda on Growth via Global Trade and Strengthening IP here. Affordable Energy: Small businesses are at the center of America’s energy revolution, and as consumers they have benefitted significantly from lower energy costs from this renaissance. SBE Council is the leading small business voice for an aggressive pro-investment approach to U.S. energy policies to create an affordable, stable and cleaner supply of energy, and more opportunities for small businesses in this vital sector. This also includes a revamped and modernized system for delivering affordable electricity to small businesses and all consumers. Access to Capital: Capital is the fuel that drives entrepreneurship and economic growth. It’s no secret that small businesses and startups need a continuous flow of capital to launch, compete and grow. During the depths of the financial crises and in the immediate aftermath of the Great Recession, the inability to access capital was a massive crises for our economy. Conditions have improved since then; lending is on the rise (but still not back to pre-recession levels) and as previously noted, the capital provided by the “Tax Cuts and Jobs Act” will certainly help many entrepreneurs self-finance expansion, new projects and provide employees with raises and new benefits. Still, on the policy front there is much that can be done to encourage capital formation and improve business lending. Our work is focusing on lifting the unnecessary burdens on community and regional banks that restrict lending, and fixing outdated Securities and Exchange Commission regulations through a JOBS Act 3.0 package of bills. Our work is also focused on leveraging the promising results we have seen on equity and debt-based crowdfunding by raising the amount that can be raised to $20 million and streamlining filings. Read SBE Council’s 2018 Agenda on Access to Capital here. Access to Broadband: For entrepreneurs, access to broadband is vital. Revitalizing Main Streets, rural communities and urban areas across America is contingent on investment and new business creation. Access to broadband, and the tools to the digital economy, are critical to this end. According to a July 2017 Wall Street Journal report: “About 39% of the U.S. rural population, or 23 million people, lack access to broadband internet service—defined as ‘fast’ by the Federal Communications Commission — compared with 4% of the urban residents.” Our agenda in this important area includes working with the Federal Communication Commission (FCC) to remove barriers that are holding back investment, deployment and innovation. There is great promise, for example, with 5G deployment and T.V. “white spaces” and we are encouraging Members of Congress to support the FCC in its “light regulatory touch” approach to all initiatives so that quality broadband is available to all Americans. Read SBE Council’s 2018 Agenda on Broadband Access and Deployment here. In the States: SBE Council works with state and local allies on improving the policy climate in the states. SBE Council’s Annual “Small Business Policy Index,” which ranks the states on their environments for business start-up and growth, is now in its 23nd year. SBE Council also produces a “Business Tax Index” that ranks the tax systems of the 50 states. 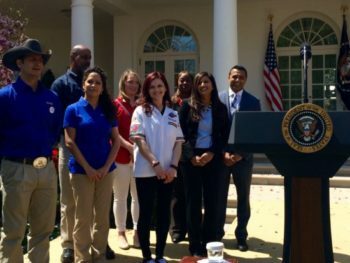 SBE Council member and five-time World Pizza Champion Brittany Saxton, owner of Six Hundred Downtown (center in her white “pizza chef” coat), prepares to speak in the Rose Garden on the dais with President Trump (April 12, 2018). SMALL BUSINESS INSIDER: SBE Council members stay updated through our weekly enews report, the Small Business Insider. This e-newsletter includes important information about legislation, market trends, educational resources, “how to” tips, and other FREE or low cost training opportunities to help your firm grow and prosper in the competitive business environment. ADVOCACY: SBE Council staff produces cutting-edge and insightful analysis for our members, the media, and elected officials to help target audiences understand the impact of legislation, regulatory proposals, and the Administration’s policies on small business. You can view our Letters to Congress here to see legislation that is supported or opposed by SBE Council. SBE Council delivers ACTION ALERTS to let you know when you need to contact your Members of Congress, the White House or take part in regulatory proceedings. 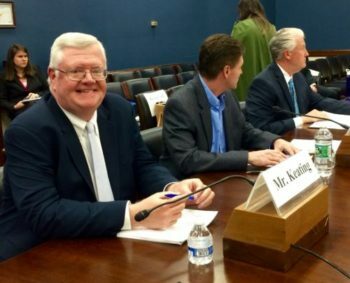 The views and ideas of SBE Council members and staff continue to be in demand on Capitol Hill, and with elected officials and policymakers at all levels of government. We meet regularly with key White House staff and the President’s cabinet, and testify before Congress about the top concerns and challenges for small businesses. 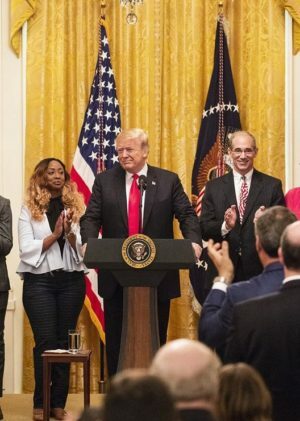 Our small business members come to Washington to testify at congressional hearings, meet with President Trump and other members of his Administration. The media taps into SBE Council analysis and staff expertise to help them grasp complex issues, and the impact of proposed policies on entrepreneurship. Our small business members also discuss these issue with reporters, on television and talk radio to help them understand the impact of policies on small business operations. A POWERFUL Seat at the Table: SBE Council will always have a seat at the table when issues impacting entrepreneurs are being discussed, debated or decided. We want you to join our efforts! The involvement and support of entrepreneurs and small business owners have made SBE Council one of the most influential business organizations in Washington, D.C. We have made a lot of progress over the past year and a half, but we must step up our advocacy and work to maintain the pro-entrepreneur, pro-growth direction of policy. PLEASE SUPPORT SBE COUNCIL. JOIN US TODAY! SBE Council is a 501c4 nonprofit advocacy organization. Contributions to SBE Council are not tax deductible.